Bullseye's eighth international exhibition for emerging artists in kiln-glass, documented in an elegant full-color catalog. Artist statements and bios of winners and finalists. Plus Evolve, a section celebrating three former Emerge finalists—Martie Negri, Nathan Sandberg, and Amanda Simmons—whose subsequent work expands the medium. Interview with jurors Kathleen Moles, Emily Nachison, and James Yood. Introduction by Lani McGregor. 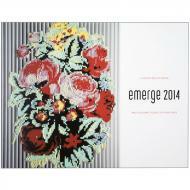 2014, soft cover, 52 pages, color.